Can Lawyers End Domestic Violence? On crime shows like Law & Order, cases are resolved in less than an hour. An incident happens, and it’s followed quickly by an investigation, arrest and resolution. But in real life, going to court and navigating the legal system is neither quick nor easy; cases can take years to resolve, and for survivors of domestic violence, going it alone -- without a lawyer -- can prolong the process, making them more vulnerable. Our data shows that nearly three quarters of victims who enter Safe Horizon shelters earn less than $6,000 annually. How can they possibly afford a lawyer, who typically charges an hourly fee of $300-$400? “Legal services improve the likelihood that women will be able to obtain protective orders from the courts, which is a significant factor in reducing rates of domestic violence,” according to a recent report by The Institute for Policy Integrity, a nonpartisan think tank. Jessica’s ex-husband was abusive. He would raise his voice in front of their children, threaten Jessica and berate her by calling her a “bad mother” or “worthless.” He would also hurt her physically: pushing her, grabbing her, or slapping her. As many survivors do, she told herself the physical violence wasn’t that serious because she never had a black eye or broken bone. When she decided to leave the relationship, she was scared her ex would harm her so she filed for an order of protection (OP). But she couldn’t afford a lawyer. She went to court but described only the verbal abuse, which is not considered a crime -- so an OP was not granted. Luckily, Safe Horizon took her case. We knew she also had to report the physical abuse so that the judge would better understand her need for an OP. She refiled successfully and continued to work with our lawyer to resolve other matters. Jessica -- and others like her -- are why our services are free for low income victims. For these victims and others who have faced verbal and emotional abuse or even extreme brutality, keeping abusers away is desperately urgent. After speaking with a sample of residents in Safe Horizon shelters we found that more than 80% reported being strangled by their partner -- a sign of heightened risk for murder. 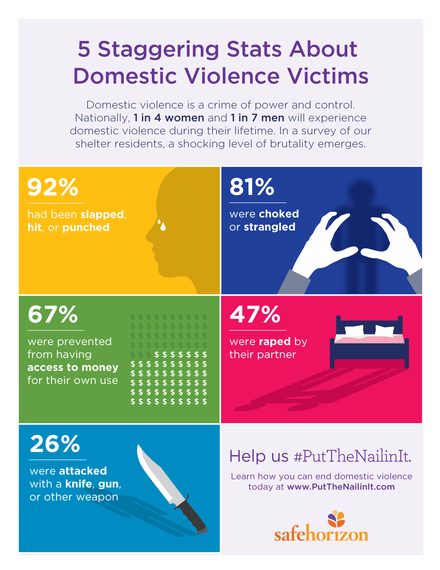 The chilling infographic below shows just how brutal domestic violence can be. Safe Horizon’s Domestic Violence Law Project represents clients seeking safety through orders of protection. I invited the project’s director, Cynthia Domingo-Foraste, to share some important insights on legal representation and orders of protection. What are the main reasons victims of domestic violence seek legal remedies? Victims seek our help when the abuse escalates and they are desperate to stop it. There are three main problems facing victims that we commonly seek to address through the court system: personal safety, familial stability and financial security. For many of our clients, the first step on their journey to safety and independence is obtaining an order that requires the abuser to stay away from the victim. We will also work with our clients to determine if other forms of relief -- such as child custody, supervised visitation, child support, or divorce -- are needed. How does a victim get an order of protection? A victim can seek an OP through family court even if the abuser has not been arrested. Having an attorney help the victim through this process step-by-step can be extremely helpful. This process is not simple. The victim has to file paperwork and know how and where to file. Afterwards, they have to present their case to a judge. While they may be given a temporary OP at first, they must come back to prove the crime. It takes a year of going to court to get a final OP. And an OP is not permanent -- it is usually good for a period of two to five years. What does it take for a victim to make this an effective safety tool? A common question I hear is, “How is a piece of paper going to keep me safe?” The piece of paper on its own is no good if it’s not reinforced by a safety plan. We try to create safety for clients through custody orders, divorce settlements and safety planning. For example, if the victim and abuser share a child, we advocate that pick-up and drop-off for visitation occurs in a public location to reduce the risk of violence. If an abuser does violate an OP, then it’s important that victims are not lenient. We advise them to report violations to the police and to keep track of them in a journal, to save all voicemails, emails and other documents that can be used to build their case in court. How does the legal process affect your clients? It affects their lives profoundly and it can be heartbreaking. Imagine going into a room full of strangers and having to relive the most horrific abuse that happened to you. Then imagine the opposing counsel, someone you’ve never met, repeatedly accusing you of being a liar. That’s essentially what a trial can look like. Clients are trying to move forward with their lives, but ongoing court dates can make it hard to keep a normal work schedule or even to pick up kids from school. The process wears clients down and part of my job is to ease this burden as much as possible. What is challenging about your work? Seeing how great the demand for our services is challenging but is also the inspiration to push on. We understand the real danger victims face when they leave an abusive relationship and our priority is to keep them safe. I remember the many clients whose lives have changed as a result of our work and I can’t imagine doing anything else. Going to court without a lawyer can be a risky business for anyone, and especially for someone who has been abused. Yet, when we don’t provide the legal services victims of domestic violence need, that is what we are asking them to do. Research indicates some 86% of the women who received an order of protection or restraining order stated the abuse either stopped or was greatly reduced. Legal services and lawyers are a part of the solution to end violence in our society. 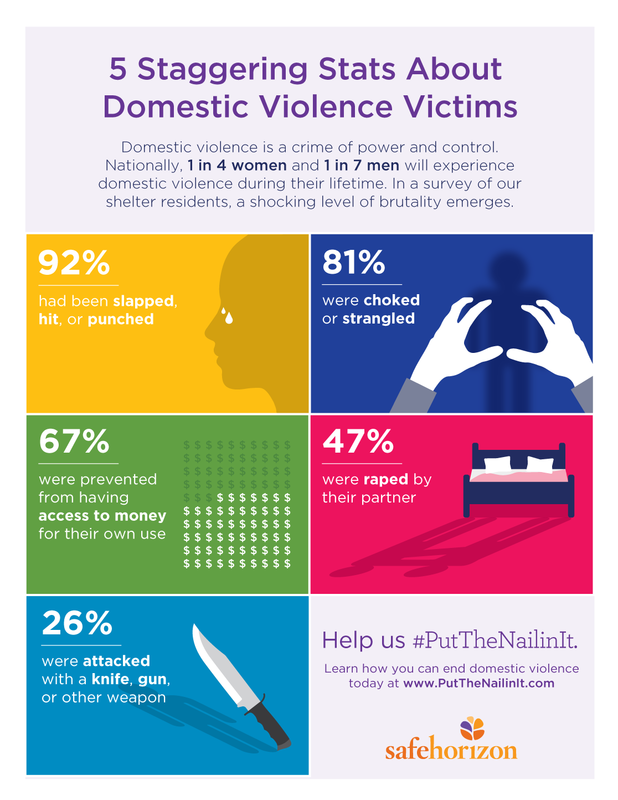 Join Safe Horizon this month in raising awareness and support for legal representation by sharing this post and our #PutTheNailinIt campaign infographic at http://putthenailinit.com/index.php/share/. The order of protection process and even the words used to describe it can be different from state to state.